This is a significant story for the 3rd Doctor because it marks the first time he gets to use the TARDIS to travel in time and space. Sure, he used it last story but that was just a quick trip to the Axon ship that was on Earth. This time he visits a human colony in the future. I thought this was a great story. It didn’t rely on a monster or anything like that. While the Master does show up, it isn’t until the fourth episode. Honestly, I kind of wish he hadn’t been involved at all since the story doesn’t need him. The main conflict is between the colonists and IMC. Earth at this point in time is overpopulated and has few remaining natural resources. Instead of focusing on colonization, the government instead has the IMC strip mine planets to send the resources back to Earth. Some people, like the colonists here, do leave Earth to try and make better lives for themselves. It makes for an interesting dynamic and is full of social commentary as the colonists represent more of the counter-culture outlook while IMC is the more conservative, greedy capitalist outlook. This is even represented in how the people on both sides look. The colonists are scruffier with beards and mustaches and worn clothing. The IMC people are clean cut and wear uniforms. We are supposed to side with the colonists and I certainly did, especially since most of the IMC people are shown to care about profits more than people and are happy to kill anyone that gets in their way. Unfortunately, the social commentary doesn’t extend to the aliens that were living on the planet before the colonists arrived. They are labeled primitives by the colonists and IMC. Some of the colonists treat them okay but IMC use them as pawns. It is never once mentioned whether humans have a right to colonize a planet where a civilization, even if it is primitive, exists. The Doctor doesn’t bring it up either, which was surprising. I hadn’t realized that Jo had never seen the inside of the TARDIS yet. She is amazed by it and comments on how it is bigger on the inside. She reacts pretty much how you would expect a person who has never traveled in time and space to react. She is scared at first and hesitant to step out on an alien world but eventually takes the plunge and does what she can to help the colonists. The Doctor knows he is being used by the Time Lords but still seems happy to be traveling in the TARDIS again. He immediately sets out trying to help the colonists and even leads a raid on the IMC ship. Mind you, IMC had kidnapped Jo and threatened to blow her up so he had reason to storm the castle, so to speak. The Master shows up pretending to be an arbiter sent by Earth to resolve the claim on the planet. He obviously sides with IMC but his main goal is to get the humans out of the way so he can discover the doomsday weapon that is hidden on the planet. The weapon turns out to be pretty powerful. It can target any star and cause it to go supernova. With it, the Master can rule all of creation. He even asks the Doctor to rule with him, saying they can be benevolent tyrants and end war and suffering. He makes it sound appealing but the Doctor turns him down. This was a big step for the series. It proved it could do stories not set on Earth and still more or less stick to the budget. Granted, the alien world here was just a quarry and contained very few aliens but it proved it could be done. Add to that biting social commentary, a gripping plot, and the Doctor and Jo at their best and you have a recipe for greatness. My only complaint is that the Master really does feel tacked on here. He could have been removed and the story would still work, and might even be better for it. The Master just muddies the waters in the conflict between the colonists and IMC and doesn’t really add anything. 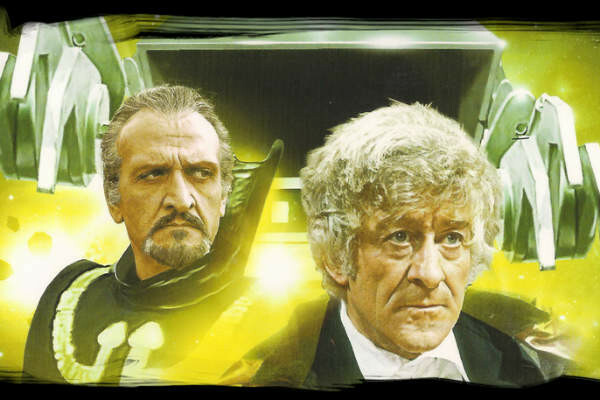 I say this is an important story to watch because it is a first for the 3rd Doctor, and hopefully provides a template for future stories, though I don’t know how many stories actually feature this Doctor leaving Earth. I just looked this serial up on the Tardis Wiki to refresh my memory, and I barely remember it at all -- I guess I confuse it in my mind with "The Mutants." I really should try to get back to my systematic rewatch, which I left off a year or two back with the end of the Troughton era. Apparently this was Malcolm Hulke's attempt to do an allegory on the conflict between Native Americans and European settlers, but it sounds like it probably didn't work out as well as Hulke intended. Also the first off-Earth story in Doctor Who to be shot in color. and hopefully provides a template for future stories, though I don’t know how many stories actually feature this Doctor leaving Earth. Two more in season 9, and then the exile is lifted. The final two seasons have a pretty even balance of space stories and Earth stories, including a couple that are a mix of both. The only way this could be an allegory to the conflict between Native Americans and European settlers is if we are supposed to view the colonists as the Native Americans and IMC as the Europeans. The primitives are given no real consideration. We learn that the colonists trade with the primitives for food, that the primitives sometimes take colonists hostage, and that a few primitives act as assistants to the colonists. There's nothing about how the humans, colonists or IMC, are invading a planet with an indigenous population.